The world has started shifting to the gurukul system of education. Now, the choice for India is whether it wants to be the leader in the mission or a follower,” said Mukul Kanitkar, National Organising Secretary of the Bharatiya Shikshan Mandal (BSM). He was speaking at a special session organised by the Panchnad Research Institute and Association of Resident Doctors (ARD), PGI, Chandigarh, on Monday, August 6, 2018, at the National Institute of Nursing Education auditorium on the PGI campus. The topic of the session was “The relevance of gurukul system in the present times”. Prof BK Kuthiala, Director, Panchnad Research Institute, said, “It is an established fact that the education system in ancient India was the best in the world. It is vital that the elements that made it the best be identified. “After that, those elements should be incorporated into today’s education system for the betterment of the nation and the world,” said Prof Kuthiala. In his address, Mukul Kanitkar said that the present education system – despite being good enough – needs a change. Our system needs to focus on “man-making for nation-building”. “For this, the gurukuls that are running presently have to be adapted for the current scenario. 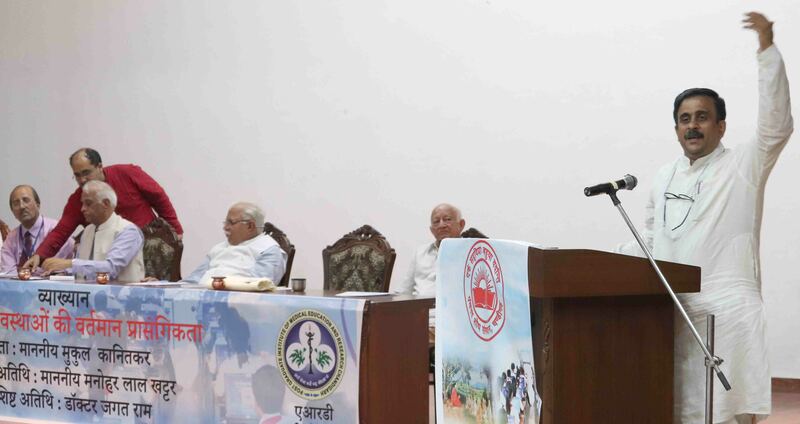 Secondly, education in other institutions has to adopt the gurukul method of teaching,” Kanitkar said. Earlier, KS Arya, Acting Chairman, Panchnad Research Institute, introduced the topic. He said education is the process of forming a human being and not an employment-generation process. Haryana Chief Minister Sh Manohar Lal Khattar was the chief guest on the occasion and Dr Jagat Ram, Director, PGI, was the special guest.